Real Estate Update for Santa Clara County August 2011! 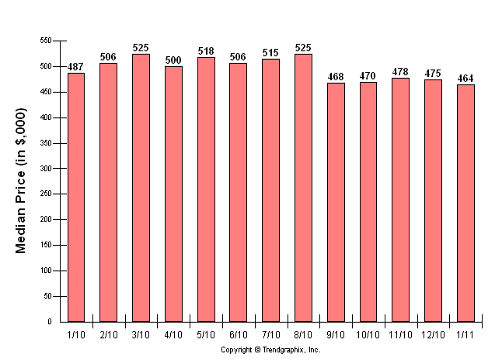 Good afternoon everyone and welcome to Raymond’s Real Estate Update for Santa Clara County and San Jose Real Estate 2011! I always like to start this out by telling everyone that I always state real numbers whether they are good or bad. Something I wish the media would do. Should you want detail information for a certain zip code as I have done for a few neighborhoods below feel free to email me and if I have numbers for that particular area I will supply them. Today, single family homes available on the mls peaked in June this year to 2,680 single family and now have fallen to 2,490 as of August 24th. From peak of 2008 to peak in 2011 that is a drop of 53%. Now, inventory down 53% yet pending properties continue to increase each month…June over July up 20% this year. If i were to average out the last 8 years excluding 2008 the inventory hovers around 2,542 in the month of July. That would mean we are pretty normal right now. 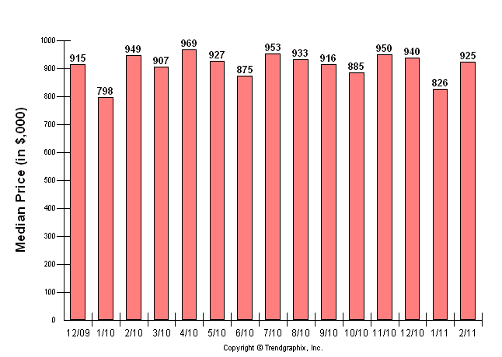 In 2008 when those numbers were 2 times higher, the pending properties were at 977 for that month April 2008. Today in July 2011 it was at 1,310. 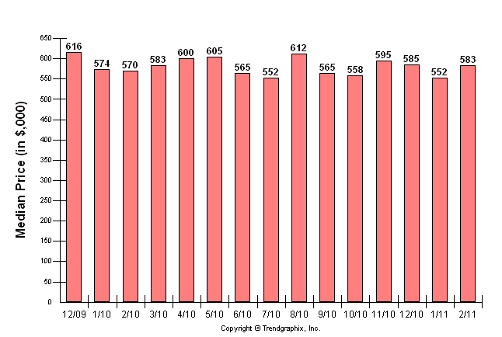 Back in 2008 we had 8.1 months of inventory based on sales. Today we only have 3 months. Yes, the median price has dropped from 2008 when it was $750,000 to today sitting at $619,000, but that has also increased from a low of $525,000 at the beginning of this year, and up 29% since we bottomed in 2009 at $442,000. In other words homes are selling. As a matter of fact homes are getting an average of 97% of the original list price to sold price. 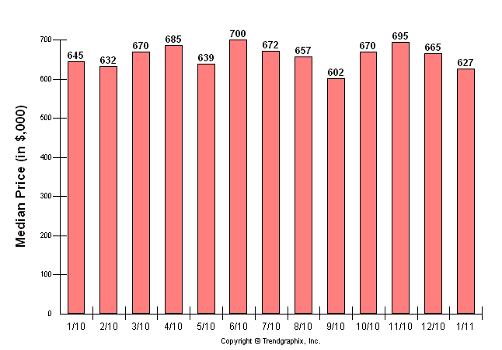 In some areas like South San Jose they are getting an average 101% of the original list price over sold price. Many renters are getting their rent increased to a point it only makes sense to own vs. rent these days. 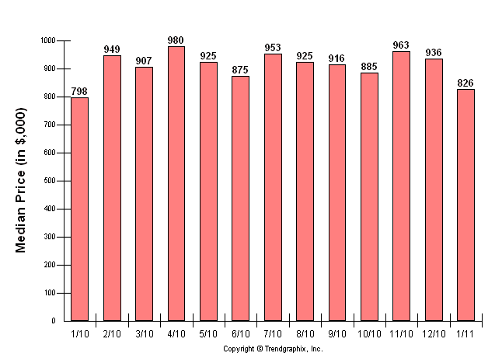 Take a look at some graphs below showing actual numbers for San Jose Real Estate, Almaden Valley Real Estate, Santa Clara Real Estate, Evergreen Real Estate, Campbell Real Estate, Blossom Valley, and Los Gatos Real Estate. Even though the median price declined by 1% from June to July last month, you can see just from the 6 areas that I pulled how good it is actually doing throughout the Santa Clara County. I didn’t even show Los Altos or Saratoga that are doing phenomenal right now. Thanks for reading Raymond Chavez Real Estate Blog! In the mean time don’t forget to visit www.raymondchavez.com to connect with me on LinkedIn or Facebook! Real Estate Update for Santa Clara County June 2011! Good afternoon everyone and welcome to Raymond’s Real Estate Update for Santa Clara County and San Jose Real Estate June 2011! The results are in and the top 2 areas for median price appreciation from April 2011 to May 2011 is the City of Mountain View 14.3% and Almaden Valley in San Jose at 12.2%. As always you will also note that I stay with facts by only showing actual numbers. Should you want detail information for a certain zip code as I have done for a few neighborhoods below feel free to email me and if I have numbers for that particular area I will supply them. Back to Santa Clara County! 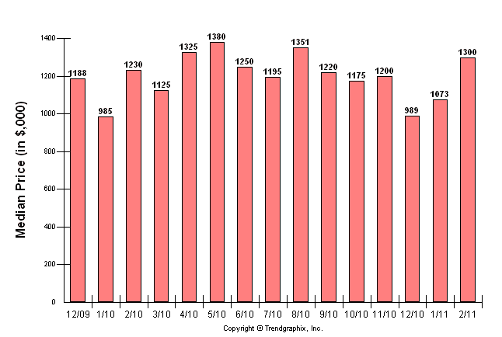 The County started at $525,000 median price on Jan. 1, 2011 and now has risen to $605,000 as of June 1st. That is a 12.9%↑ appreciation from the beginning of the year and a 4% increase just from April to May 31, 2011. The amount of homes that went into pending status for May over April was a whopping 21.2%↑ jump. Keep in mind this is not the norm as you may be thinking since last year at this time it actually decreased by 21.6%. As far as the inventory, it has only climbed 1%↑ or 27 single family homes to 2632 total for Santa Clara County from April to May 31st as a whole. This is another positive sign on where the Real Estate Market for the County and San Jose area are going. 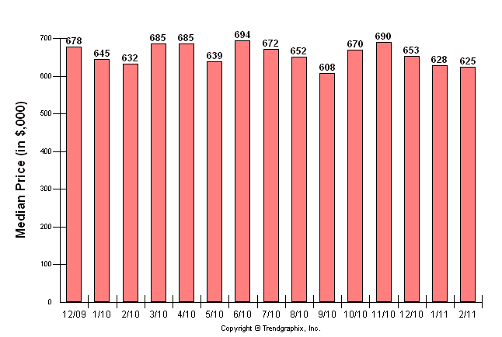 The absorption rate based on pending sales sits at 54.6%, which means 54.6% of the homes that listed in May 2011 went into contract the same month. 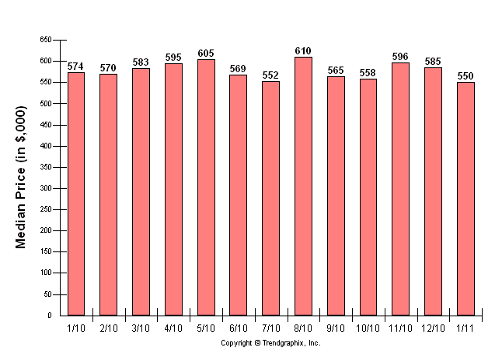 Take a look at some graphs below showing actual numbers for San Jose Real Estate, Almaden Valley Real Estate, Santa Clara Real Estate, Evergreen Real Estate, Campbell Real Estate, and Los Gatos Real Estate. 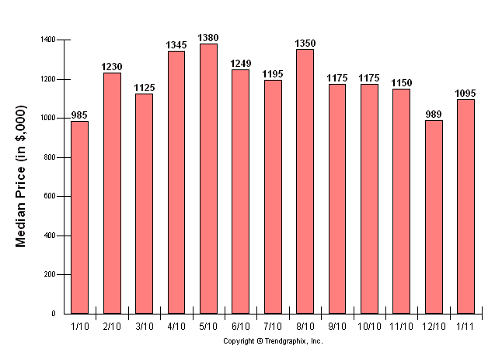 Real Estate Update for Santa Clara County May 2011! Good afternoon everyone and welcome to Raymond’s Real Estate Update for Santa Clara County and San Jose Real Estate! You will read how the market is consistently improving like Evergreen MLS area at 39.3% appreciation from March to April this year. You will also note that I try to stay with facts by only showing actual numbers. Should you want detail information for a certain zip code as I have done for a few neighborhoods below feel free to email me and if I have numbers for that particular area I will supply them. Well, considering we now have had rain 30% of the days this year in San Jose, the median home price still appreciated 11.6%↑ over the last 4 months as of May 1st. The amount of homes that went into pending status for April over March was only a difference of a 7 home decrease for the whole County. As far as the inventory, it has climbed 10%↑ to 2605 as of April 30th still down from a seasonal average of 4000 or even when we were at peak median price for the county $867k which we had 3233 homes available April 2007. Another reason why home appreciation is still on the rise at a time when many think we haven’t hit the bottom. 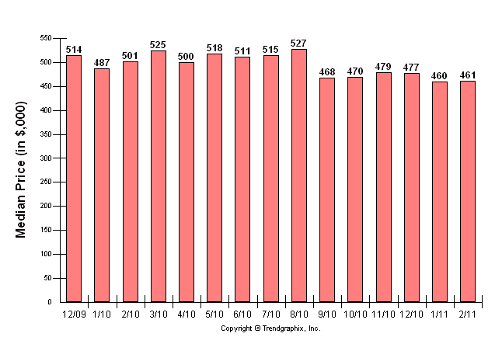 The absorption rate based on pending sales sits at 51.1%, which means 51.1% of the homes that listed in April 2011 went into contract the same month. Pretty good numbers when you compare to previous years same month like April 2008 when it was only 15.5%. Real Estate Update for Santa Clara County March 2011! Good morning everyone and welcome to Raymond’s Real Estate Update for Santa Clara County that includes San Jose Real Estate of course! You will read how the market is consistently improving regardless of some major websites I won’t mention. You will also note that I try to stay with facts by only stating actual numbers. Should you want detail for a certain zip code as I have done for a few neighborhoods below feel free to email me and if I have numbers for that particular area I will supply them. The amount of homes that went into pending status for February 2011 jumped 22.1%↑ over January 2011. I know what you’re thinking…that’s normal right? Yes, it’s normal for more buyers to come out and jump into the market as we get closer to the spring months, but what’s better than that Jan.11-Feb.11 had an increase of 7.3%↑ vs. same months prior year Jan.10-Feb.10! Also, Feb. 11 vs. same month 1 year ago increased by 19.8%↑. In other words we are off to a great start. While many believe there are many homes on the market when driving down their neighborhoods the reality is inventory is still very low. When you think about there are 1,764,000 people who live here and only 2,380 single family homes available for sale is not very much. 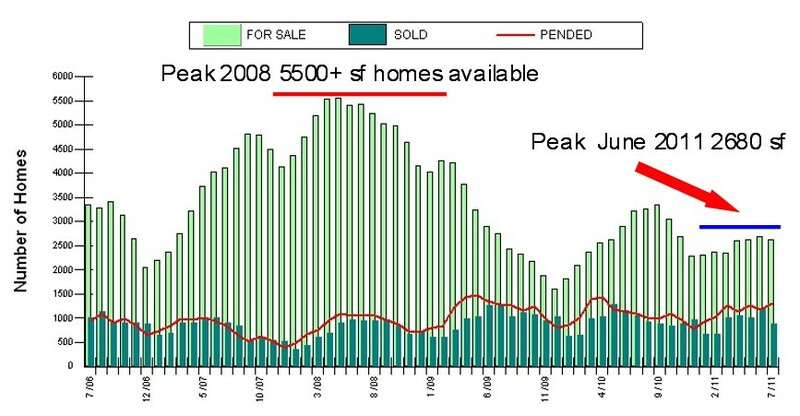 The big reason why prices are climbing as you will see below in the graphs for many areas within the Santa Clara County is for that very reason…no supply and big demand. The absorption rate based on pending sales jumped nearly 8%↑ from Jan. 11 to Feb. 11 now at 50.4%, which means 50.4% of the homes that listed in Feb. 11 went into contract. What’s the big deal you may ask? Well, it topped Feb. 10 by 2.7%, and when you think about the nice summer month September 2010 had only a 29.5% absorption rate. The market is increasingly getting better right before our eyes…it’s too bad there are many out there who still do not realize it. Take a look at some graphs below showing actual numbers for San Jose Real Estate, Santa Clara Real Estate, Campbell Real Estate, and Los Gatos Real Estate. Should you have any questions or if you know someone who can use my assistance in the Real Estate Market please do not hesitate to call me at 408-655-7900! In the mean time don’t forget to visit www.raymondchavez.com to connect with me on LinkedIn or Facebook! Real Estate Update for Santa Clara County Jan.2010-Jan.2011! So, do the numbers and you will see we are down 24%↓ from 2 years ago when it comes to distressed homes for sale! The other thing is that our inventory while it is slowly climbing as it should at the beginning of the year is still well below normal currently hovering at 2,402 single family homes in Santa Clara County. The absorption rate for pending sales in January 2011 jumped 9% from Dec. 2010 now at 45.6% (meaning 45.6% of the listing went into contract for that month), versus same 2 months a year ago when it dropped 24.9%. The median price increased 2% over same month a year ago, and the amount of homes that went into contract in Jan. 2011 over Jan. 2010 sky rocked by 22%. So, you have to ask yourself, why doesn’t the media ever talk about this rather than mentioning the County depreciated by 15% as some news channels recently talked about, and failing to note that this happens almost every year in the real estate market. Also, the media failed to tell everyone that Dec. 2010 was one of the top 5 best months for home sales last year. Something to think about for those who think Santa Clara County shuts down in our mild winters.